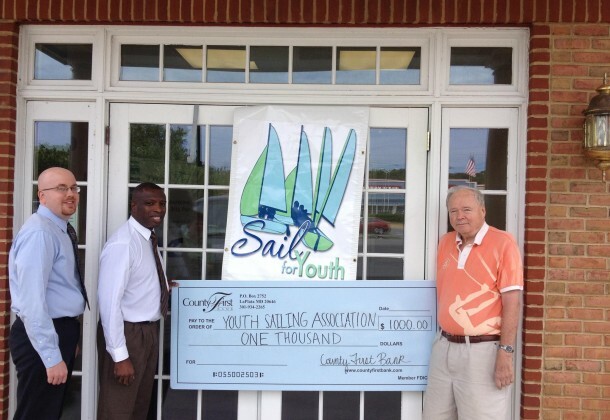 Stovy Brown, Director of the Southern Maryland Sailing Foundation, shown here receiving a check for “Sail for Youth” from County First Bank, praised the community for their support of the foundation. “Sail for Youth,” run by the Southern Maryland Sailing Foundation, raises money and awareness for their youth programs. The support of local businesses like County First Bank enables the Sailing Center Chesapeake to maintain their facility in Tall Timbers, allowing two dozen or so local students to practice three times a week and resulting in stronger finishes each season. One such championship students prepare for is the locally hosted 2014 Mid-Atlantic Scholastic Sailing Association (MASSA) Varsity Championship, held in October at Tall Timbers, MD. MASSA brings a larger spectrum of students from New York, New Jersey, Pennsylvania, Maryland, and Virginia schools to the SCC. Such teams routinely compete for the top national spots, Mr. Brown explained, so look forward to great sailing and treating them to that legendary Southern Maryland hospitality! SCC’s boat sponsorship program is also seeing an uptick in sponsorship interest from local businesses due to this championship. For an appropriate donation, local businesses can display their company name and logo on the transom of one of the Center’s 18 Club FJs. For more information, contact the Southern Maryland Sailing Foundation at www.smsailingfound.org or the Sailing Center Chesapeake at www.sailingcenterchesapeake.org.